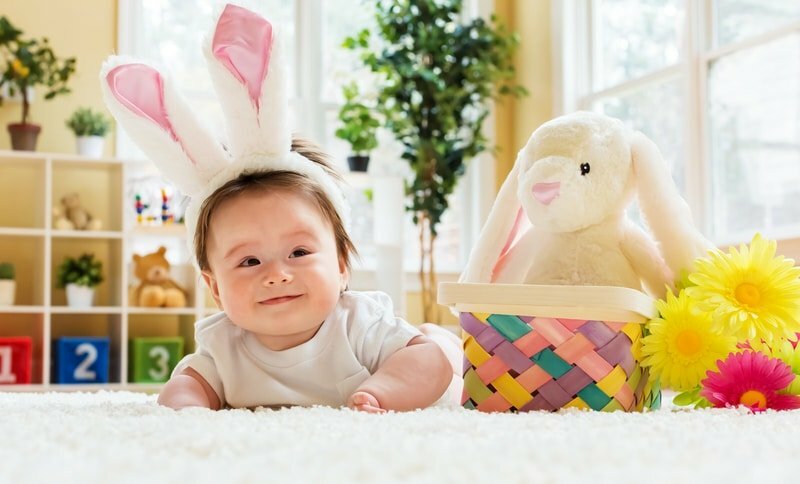 Your Eco-Friendly Easter Guide Is Here! Skip the plastic baskets that fall apart and don’t biodegrade. Instead, invest in one that can last for years to come with a soft bucket, wicker basket or even a fun, personalized metal beach pail. The soft buckets are especially good for little kids who might find a basket or pail unwieldy. This cute bunny from Pottery Barn Kids is just one of their many reusable basket offerings. A beautiful felted basket can be used and displayed for celebrations, too. Search Etsy’s artisans for a huge array of personalized painted metal Easter pails which can be used for more than just egg-hunting. Or, go for a wicker basket with a personalized liner, so the basket can be reused throughout the year. And, importantly, swap that plastic grass for paper or raffia grass – it comes in every color and can be recycled. Wooden eggs are beautiful and can be reused for years and treasured as family heirlooms. For a bonus eco-friendly Easter craft, grab a set of plain wooden eggs and some nontoxic paint, and decorate them with your kids. If you’d like to use real eggs, this helpful guide will instruct you on how to achieve virtually every shade of the rainbow with natural ingredients like coffee and red wine! If you choose to use solid wooden or real eggs, but worry about missing out on the fillable egg fun, just have your little egg hunters “trade in” their eggs later to get their treats from the Easter bunny! You can still invite some chocolate bunnies to your eco-friendly Easter if you want to! Seeking out Fair Trade chocolate is always a good idea – sadly, much of the world’s chocolate industry utilizes child labor and slavery to keep prices competitive (here’s more on why buying fair trade chocolate matters). Paying a little more for responsibly sourced and eco-friendly Easter chocolate means you can feel good about that little bunny showstopper in the middle of your Easter display! Here’s one from Lake Champlain Chocolates, a responsible chocolatier from Vermont. A solar powered phone and gadget charger to keep all their devices topped up using just the sun’s rays! Fun new art supplies like confetti crayons or this tiny little marker set! These awesome bracelets that support 4Ocean’s mission to remove the 16 billion pounds of plastic that finds its way into our oceans each year. Think outside the conventional traditions of Easter and start some traditions of your own by investing in something beautiful and sustainable, like an annual scavenger hunt for these wooden bunnies and start a tradition of your own – with no candy or bright plastic in sight! Get some inspiration from this roundup of Easter traditions around the world. From eco-friendly Easter celebrations to every-day household cleaning, we love helping our customers make healthier product choices. Our revolutionary cleaning system, Force of Nature, is beloved by households concerned about the safety of their cleaning products. Utilizing simple household ingredients, our powerhouse cleaner is as effective as bleach, yet gentle enough for a pacifier or high chair tray. For more great ideas on how to create an eco-friendly home, check out our Chemical Free Product Guides. Electrolyzed Salt Water: The Science Explained.